Suspended "NBC Nightly News" anchor Brian Williams "has the chance to earn back everyone's trust," his boss at NBC News said Thursday, as the network confirmed that Williams will return to television later this summer, but in a reduced role. NBC also confirmed that Lester Holt, Williams' fill-in since February, will become the permanent anchor of the "Nightly News." The appointment makes Holt the first African-American solo anchor of a weekday network nightly newscast. In a press release, NBC News chairman Andy Lack credited Holt with performing "remarkably well over the last few months under very tough circumstances." As for Williams, Lack said the anchorman's "excellent work" in the past had earned him a second chance. Williams quickly embarked on what was dubbed an "apology tour," meeting with NBC staffers in both New York and Washington D.C., where he was "deeply apologetic." After Williams' suspension ends in August, he will have two main jobs: he'll be an "anchor of breaking news and special reports" on NBC's ratings-starved MSNBC cable news channel, and he'll "serve as a breaking news anchor for NBC News live special reports when Holt is not available." Here's how the news was reported on Thursday's "Nightly News:" "Brian Williams is staying with the NBC family; he'll be covering breaking news with our colleagues at MSNBC when his suspension ends." The decision caps months of deliberations by network executives. "As you would imagine this was a difficult decision," Lack's boss, NBCUniversal CEO Steve Burke, said. "Brian Williams has been with NBC News for a very long time and he has covered countless news events with honor and skill. As I said in February, we believe in second chances, and I am hopeful that this new beginning will be good for Brian and the organization." The new arrangement means that Williams will take a "substantial" pay cut, according to a person with direct knowledge of the deal. (The New York Times first reported the salary change.) The contract Williams signed two months before his suspension reportedly guaranteed him $10 million a year for the next 5 years. Furthermore, a revised contract for Holt will pay him "significantly" more than Holt currently makes, the person said, declining to put a specific price tag on the deal. Breaking his silence for the first time since February, Williams, 56, began his own statement with two simple words: "I'm sorry." "I said things that weren't true," he said. "I let down my NBC colleagues and our viewers, and I'm determined to earn back their trust." NBC confirmed an earlier CNNMoney report that Williams taped an interview with Matt Lauer, the co-host of the "Today" show, earlier this week. Parts of the interview will be shown on Friday's "Today" show and "Nightly News." Thursday's statement and Friday's interview segments are the start of a comeback attempt by Williams, who was suspended in February amid a controversy over exaggerated stories. He was suspended after he admitted "misremembering" an incident in which he claimed his helicopter was struck by a rocket-propelled grenade in Iraq. Williams was not on the chopper that was attacked. 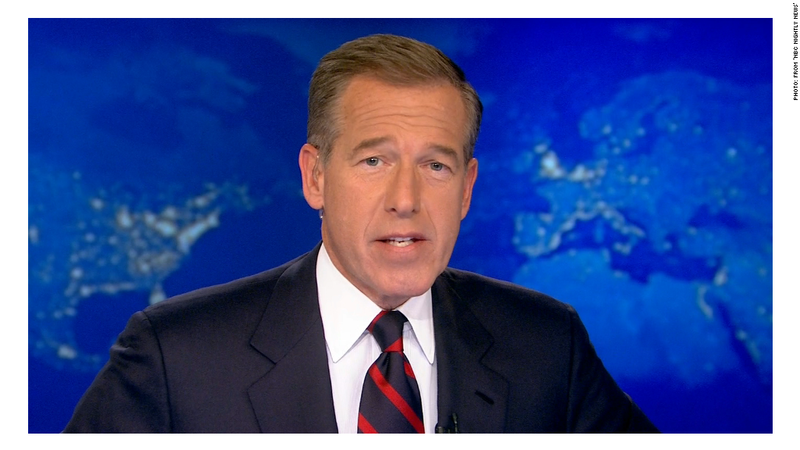 NBC launched an internal investigation to fact-check the anchorman and identified several other times when Williams exaggerated. But the network said Thursday that it would not publish the detailed results of the investigation. Instead, it offered a two paragraph summary of the findings. "The extensive review found that Williams made a number of inaccurate statements about his own role and experiences covering events in the field," NBC said. "The statements in question did not for the most part occur on NBC News platforms or in the immediate aftermath of the news events, but rather on late-night programs and during public appearances, usually years after the news events in question." In other words, the network bosses concluded that Williams' puffed up stories were embarrassing, but not career enders. Williams elaborated on the exaggerations in the forthcoming interview with Lauer. The NBC News headquarters in New York was abuzz this week about an imminent Williams announcement. CNNMoney reported on Wednesday evening that the anchorman would be staying with the network in some sort of new role. Speculation centered around MSNBC. Still, some television news analysts expressed surprise on Thursday that Williams had actually accepted a demotion of sorts. Then again, leaving NBC altogether may have been the anchorman's only other choice. One senior executive said the notion of Williams returning to "Nightly News" at the end of his six month suspension was a non-starter. The executive described Williams' removal from "Nightly News" a "severe punishment," but an appropriate one. Keeping him in the fold avoids an awkward scenario where Williams could show up on a rival network or web site and potentially embarrass NBC. The move back to MSNBC will be a homecoming of sorts for Williams: he anchored a signature 9 p.m. newscast on the cable channel back in the late 1990s before ascending to "Nightly News." The cable channel has changed dramatically since then. It is now known for its liberal bent, particularly with its afternoon and evening programs. But Burke and Lack seem to be bending it back somewhat. Williams "will be the face of MSNBC" when there are big breaking news stories, a person with knowledge of the channel's plan said. NBC said Mark Lukasiewicz, a senior vice president for special news reports, has been charged with leading "a team to strengthen MSNBC's daytime coverage by further leveraging NBC News' expertise in breaking news." That might mean that Williams will take over for the channel's existing anchors whenever there are significant developing stories. Williams concluded his statement by saying, "I am grateful for the chance to return to covering the news. My new role will allow me to focus on important issues and events in our country and around the world, and I look forward to it."